Can music lead to a life of drug dealing and violence? Well, I believe that the music played by the narco corridos in Latin America are doing just that. Their music may seem upbeat and fun since it is set to a polka beat, but they have extremely violent lyrics. According to the Vancouver Sun, many young people are turning to the narcocorridos for inspiration during hard times. Their songs start out telling of their great houses and expensive cars that make their life seem to be perfect. Then, they continue the same song with lyrics and words about drugs and killing. It would only makes sense that young adults would want the wealth of the drug traffickers, but they do not realize the consequences that go with it. Mr. Edberg, a member of the Sinaloan legislature stated, “You’ve got these glamorous mythological figures, and if you take a 12-year-old kid who is living on a dirt road, no electricity, some very high poverty setting and they see these people, it’s a fantasy to be able to live like that. To have all that power and to be able to be so powerful even the government is afraid of you and they can be corrupted by you.” The narco corridos make drug dealers and traffickers seem like rockstars. It is not just the fact that they are advertising them and making them seem like gods, but they are also spreading the stories, in great detail, of the murders committed by drug runners. According to Elijah Wald, a former blues guitarist who has written a book on narco corridos, the first thing a drug runner does after committing a crime is hiring a narco corrido to write a song about it. These songs have become so dangerous to not only the people who are negatively influenced by them, but also for the narco corrido members. If they write a song about a certain gang committing crimes, then the opposing gang might find them and kill them so they cannot help out their enemies. 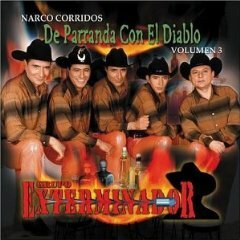 Narco corridos have caused so much controversy that many places have banned them from their radio stations. Mexican authorites are unable to legally ban them due to the “freedom of speech” legislation, but many radio stations are doing this voluntarily. In conclusion, I believe that narco corridos are a terrible influence on everyone that listens to their music. Children and teens, especially those in poverty, should not listen to these songs and should not be sucked in by the wealth and infamy of the gangsters. I can’t believe the narco corridos are considered free speech! Even though it’s obvious how much harm they have caused. How can the narco traficantes be so proud of the terrible and disgusting things they do? On the tv show CSI Las Vegas a criminal who was a narco traficante was caught for viciously murdering a woman because he had a narco corrido made about his crime. The criminologists heard the song and were able to link it back to him! If only that was the fate of all the narco traficantes.